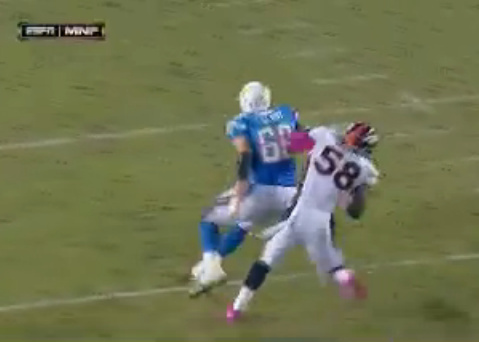 There are so many elements of outside linebacker Von Miller's game that can be praised. He excels against the run, drops into coverage naturally, and gets after quarterbacks better than any other 4-3 outside linebacker in the NFL. And he's just getting started. "I've got a long way to go, I am my biggest critic and I feel like I have a long way to go and lot of work to do," Miller, a third-year linebacker out of Texas A&M, said after practice on Wednesday. Last season, Miller recorded 68 tackles (28 of them for losses), forced 6 fumbles, recorded an interception, and notched 20 sacks (his official number is 18.5—he recorded 20 if given full credit for half sacks). ProFootballFocus.com gives full credit for half sacks and put Miller down for 20 sacks, 56 hurries, and 92 total quarterback pressures in 2012, giving him a plus-52.9 grade as a rusher. Additionally, PFF says Miller has no weaknesses as a rusher, calling his second season "astonishing". Since joining the Broncos as the second overall pick in the 2011 NFL draft, Miller has officially recorded 30 sacks. Today, we look at six of Miller's sacks from last season. Von's first sack of the season came in Week 1 (naturally) in a Sunday Night Football showdown against the Pittsburgh Steelers. His first sack occurred just after the 2:00 warning, the play below is his second of the game. The Steelers are trailing 31-19 with 1:18 left in the game and must pass to stay alive. Obviously, these are precisely the type of situations Miller thrives in as a rusher—when Defensive Coordinator Jack Del Rio knows teams are going to throw, utilizing Miller's greatest strength (pass rushing) is a no-brainer, especially with Pittsburgh facing a third down. The Broncos—who appear to be in a unique 3-2 front with several defensive backs walking up to the line of scrimmage—are running a stunt that has safety Mike Adams rush off the edge and Von Miller crossing over to rush inside the "B" gap (between the left tackle and left guard). The blitz confuses both the tackle and guard (who appear to be Max Starks and Willie Colon, respectively), as both players initially follow Adams before Colon finally tries to pick up Miller, but he was too late. 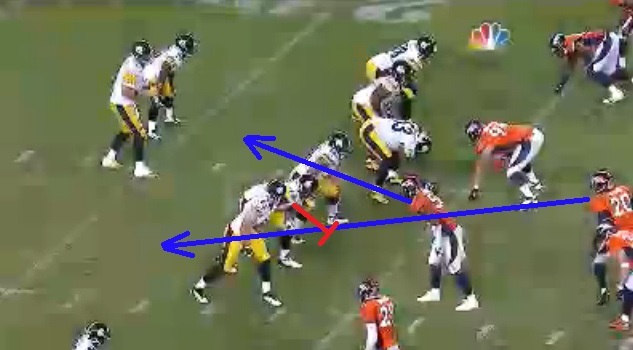 Nickel cornerback Chris Harris is also blitzing, which contributes to Pittsburgh's confusion. 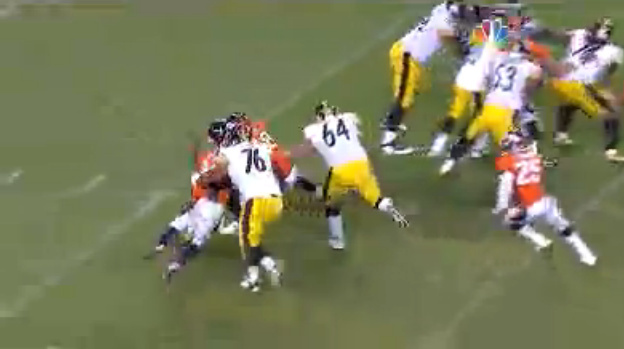 Miller essentially goes unblocked, getting to Ben Roethlisberger for his first sack of 2012. Last season, Miller had nine sacks in three seconds or less from snap to sack, which was an NFL high. A few plays later, the Steelers faced a 4th-and-15 situation and Roethlisberger was sacked again, this time by Wesley Woodyard. A kneel down the next play by Denver's Peyton Manning wrapped up the game. Miller's third sack of the season came a week later on Monday Night Football against the Atlanta Falcons. Once again, Miller's sack comes in the fourth quarter. This time, the Broncos are trailing 27-14 with 10:20 left in the game. The Falcons are facing a 3rd-and-9 and if the Broncos were going to get a chance for a comeback, they would need to get the ball back first. With two defensive backs up at the line of scrimmage again, Denver appears to be in a 4-1 look (four men on the line of scrimmage, including Miller, with defensive backs on either side—one of them is stacked behind Miller—and a linebacker behind). It's an intimidating look, but the Broncos only rushed four. Feeling pressure from the inside, Falcons quarterback Matt Ryan tires to scramble outside, but is unable to outrun Miler, who tracks him down. The Broncos ultimately lost the game, 27-21. 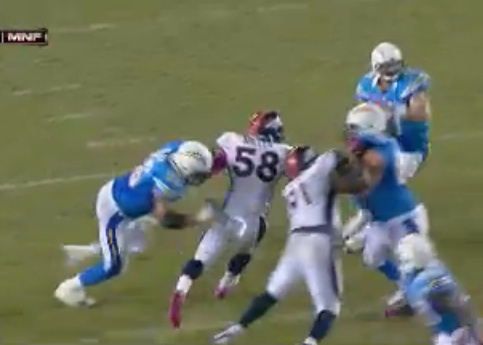 But Miller's late-game sack did help the Broncos get back into the game before falling just short in their comeback. Miller would go sackless for two weeks after taking down Ryan in Week 2. 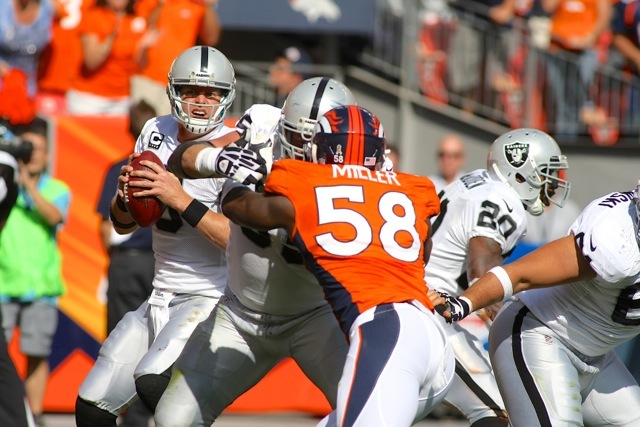 Notching eight combined tackles against the Houston Texans and Oakland Raiders in weeks 3 and 4, Miller had a bit of an early season slump. But Miller returned to form against the pass-happy New England Patriots in Week 5, recording two sacks. Let's take a look. 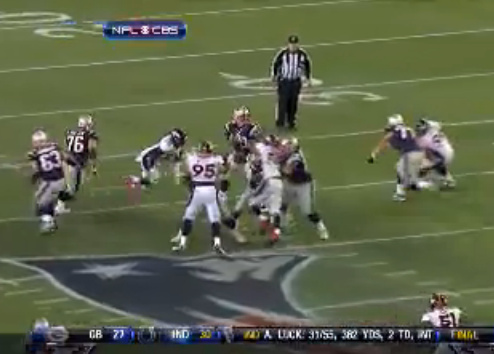 Miller's first non-fourth quarter sack came against New England with 14:15 remaining in the third. Continuing a trend that we have already seen, the Broncos are in a 3-2 look with two defensive backs up near the line of scrimmage. 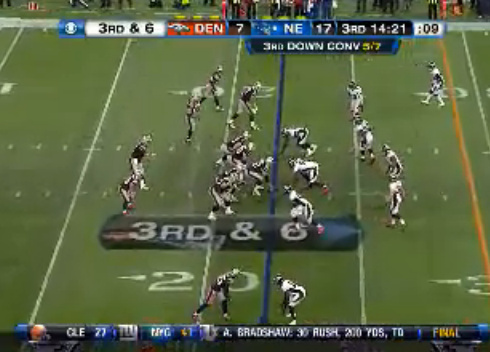 The Broncos only rush three, but the stellar coverage from the nickel defense forces Brady to feel the pressure (he ducked when nobody was near him). Panicked, Brady holds on to the ball too long and Miller runs all the way around behind him and comes up to make the sack. 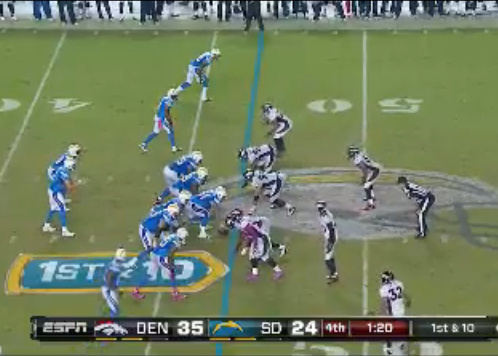 The third down sack gave Denver the ball back and moved Von's sack total to four on the year. Miller finished the game with eight tackles (five of them for losses) and recorded his second sack with 13:29 left in the game, with Denver trailing 31-14. Once again, the sack came on third down. This time, the Broncos are in a 4-2 look with Miller and Elvis Dumervil rushing off the edges and Joe Mays and Wesley Woodyard playing linebacker. 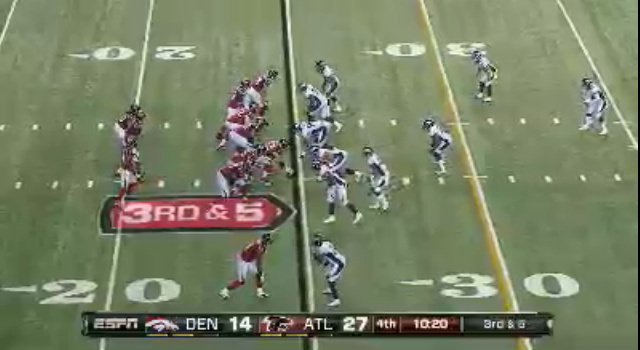 Denver runs a stunt with Woodyard blitzing and Harris rushing again from the left side of the defense. Dumervil drops into coverage (something you don't see every day) and Miller once again takes a long loop to get to Brady, reaching him before he can get the ball out. 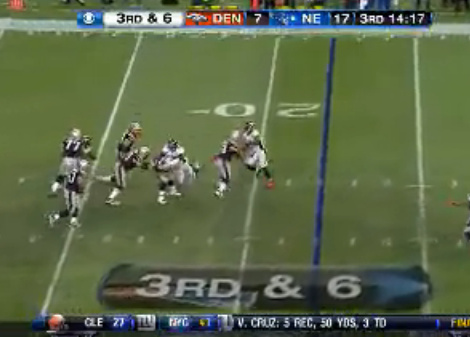 The sack led to a Patriots punt, but the Broncos still ended up eventually losing the game, 31-21. Miller followed up his two-sack performance with another sack the following week against the San Diego Chargers on Monday Night Football. Yes, that game. Denver trailed the Chargers 24-0 at halftime but came back to claim a 35-24 win in the second half, moving them to 3-3 on the season and propelling them into a ten-game winning streak. The sack came with 1:19 remaining in the game when the Chargers were attempting a comeback of their own. The Chargers have a 1st-and-10 and the Broncos have a 4-1 defensive look with two defensive backs in the box (one of them is covering the slot receiver—but that cannot be assumed by San Diego, especially when playing Del Rio, who likes to rush Harris from the slot cornerback position). The Broncos rushed four (Woodyard, the linebacker, originally rushed before following the running back out of the backfield) and Miller simply won his one-on-one battle with the right tackle to record the sack. Miller makes a fool of San Diego's right tackle is Jeromey Clary, engaging him with his arms first (keeping Clary away from his own chest and his pads) and then using a simple arm-slap move to get around him. 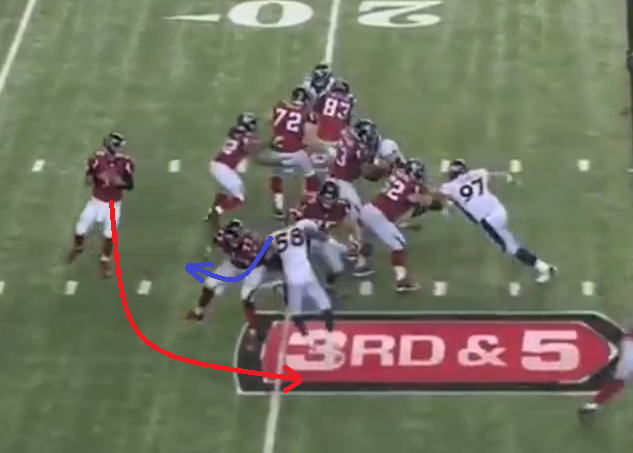 Miller faked like he was going to the outside (Clary's right), which caused the right tackle to react just slightly enough for Miller to use the tackle's own momentum to shove him left (Clary's right) and rush inside. Miller made Clary look silly, as he did often in 2012. Of Miller's 20 sacks, three of them came against Clary, as did four other quarterback hurries. A Dumervil sack/strip forced later in the drive was recovered by Adams and led to a Denver kneel down that won the game for the Broncos, 35-24. Miller curiously would go sackless the next week in a 34-14 win over the New Orleans Saints on Sunday Night Football. With the Saints being a pass-first team, it's surprising that Miller was unable to bring down Drew Brees. But Miller was asked to be more than just a rusher in Week 8. Dropping into coverage and playing the run throughout the game, Miller fulfilled his duties as Denver's 4-3 "Sam" linebacker. On the play, Miller out-powers the right tackle to get to Dalton. 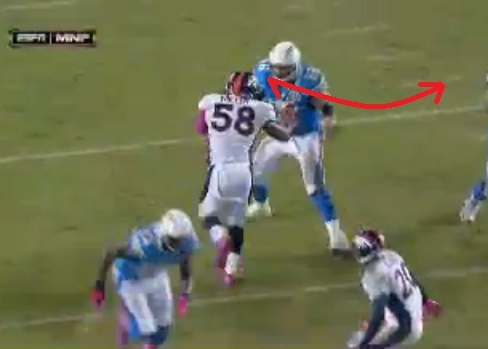 A text-book Von Miller bull rush, something he first debuted against the New York Jets as a rookie in 2011. Miller would go on to record 14 more sacks in 2012, the rest of which we may review at a later date. Many of Miller's came on third-and-long situations, when teams are forced to throw. In crunch time, Miller came through for Denver. Early in the season, Miller recorded all of his sacks while rushing from the left side of the defense (the QB's non-blindside). 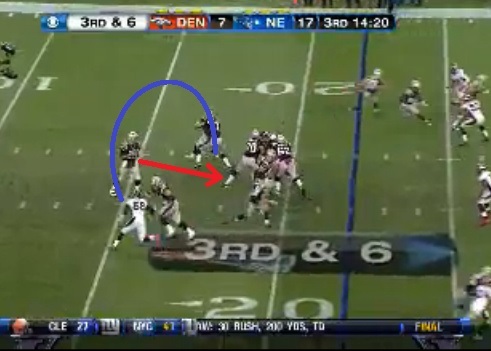 Miller needed no help getting to QBs; they could see him, but could not escape him. The Broncos have a "base" 4-3 defense, but most of Miller's sacks came from various forms of schemes that often included only three down linemen. 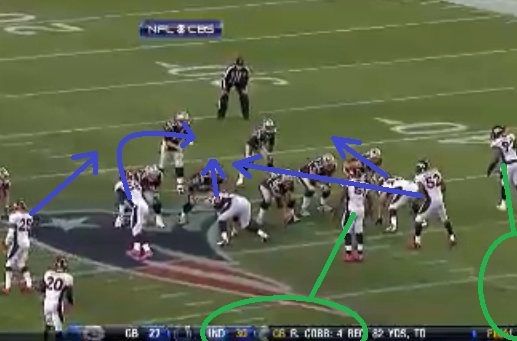 Additionally, blitzing defensive backs often contributed to Miller's success, confusing the offensive line. Miller's motor is relentless. It sounds cliché, but Miller's relentless motor is what led to many of his sacks last season, as QBs were unable to escape his pursuit. Going into the 2013 season, the sky is the limit for Miller. He can do much more than just rush the passer, but that element of his game is one of the most exciting to watch. Expect another exciting performance from him in 2013.